First Daring Cook Challenge, First Lesson Learnt! ¡Primer reto como Daring Cook: lección aprendida! This was great. I didn't know I could try to do it and not fail. But I did it, I did it! You can see a photo: my cassoulet just out of the oven for tasting. Ha sido una experiencia fantástica. No pude imaginar que lo lograría, pero aquí está. Podeis verlo en la foto: una cazuela recién salida del horno, lista para probar. This has been a great experience. 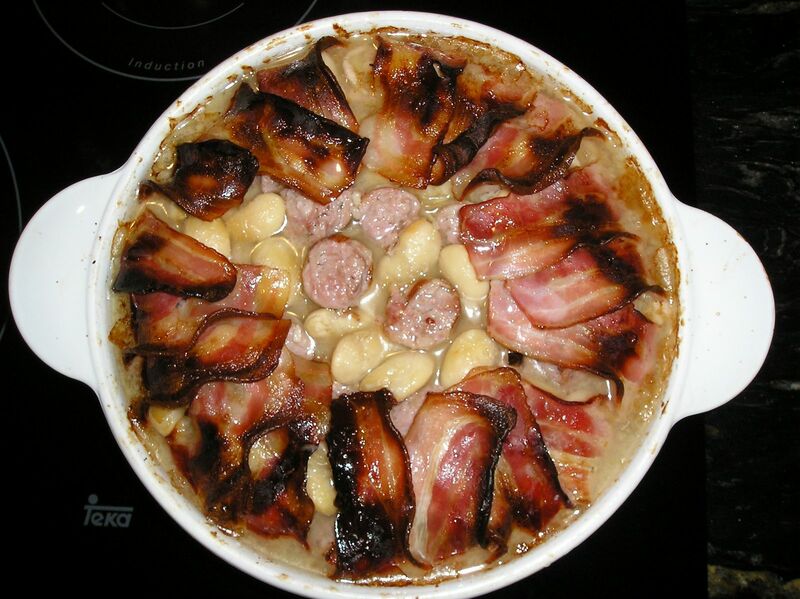 It is called cassoulet and it is a french recipe. It is January 2011 Challenge for the Daring Cooks. You can get more info and become a member at The Daring Kitchen. You will face a new cooking challenge every month, so you keep learning both recipes and techniques, from all over the world! This January, mi first challenge after joining the Daring Cooks, Lisa and Jenni chose a French and comforting stew to cook. Thanks to you both: a great idea, a wonderful follow up in the forum and guaranteed results! I can tell you the results are worth the journey. Is is not so huge a load of work but a question of planning it carefully. It is a three days preparation (and don't worry if you keep it once finished one or two more days in the fridge, flavours will melt together and it will improve the whole). It is so easy to start with that you can invite friends for Friday dinner and have it ready along the week. With a side salad or some cheese and grapes or cheese and honey for a dessert you will feed a crowd (my prep was enough for 8 servings and it was half the quantities in the original Daring Cook Challenge). You can find the original recipe and some variations (vegan version & quick version) in the Daring Kitchen webpage. Here you can find my version. The night before range the hindquarters in an oven-proof pan, generously sprinkled with salt. Put the beabs in a swallow bowl and cover with water (at least 5 to 7 cm. on top of the beans). They will absorbe three times their volume, so they will need a lot of water covering them overnight. Next morning, heat your oven to 190º. Turn the chicken with the skin touching the bottom of the pan. Arrange the thym and rosemay on top of the chicken. The lard should top everything. It will melt in the oven. Cover with aluminium foil and put into the oven for an hour. This same day, you can boil the beans. In a big saucepan, put the beans, the onion (without the skin) with a clove sticked to it, the slaurel leave, the belly pork and enough water to cover it all. Let come to a boil. Add cold water. Let come to a boil again and add some cold water. Now, you can leave them boil slowly for 1 to 2 hours, until they get soft. Let cool, drain the beans. You must keep the liquid and the belly pork, for you will need them to arrange your cassoulet next day. Take your chicken confit out of the fridge and let it warm on the counter. Tear all the chicken meat out of its bones. Reserve the lard and chicken sauce (it should be a jelly). With some of the lard from the confit, fry in a pan your sausages. Take them out of the pan, and cook the onion sliced in small pieces and the garlic clove. In a food processor, make a sauce with the cooked onion and garlic, the chicken jelly and some lard. Reserve. Heat your oven to 190º. Take an oven-prof deep casserole. Mine is 9 cms. deep and 24 cms in diameter. Line it with the bacon strips. Put in layers a third of the beans, half the chicken meat and half the sausages cut in small pieces. Repeat and finish with the last third of the beans. Pour the reserved sauce (made out of onion, garlic, larda and chicken jelly) over the top and voer with the bean boiling water till it is levelled. Cover with more bacon strips. Bake for 1 hour at 190º and 1 more hour at 130º. Let cool overnight. Day 3: Ready to serve! Heat your oven to 190º. Bake your cassoulet for 1 hour and ... it is ready to serve! To make it even easier, look at the diffeent steps in this slide show. Your cassoulet is gorgeous and I love the slide show step by step! Thanks for taking part in our challenge!! Beautiful job on this challenge!